Keeping your doors and windows locked helps lower your risk of break-ins at your home, but you should also take steps to deter intruders in the first place. Adding security lighting to the exterior of your Dallas-Fort Worth home is one of the most effective ways to keep intruders at bay. Keep in mind that while security lights are practical, they also come in styles that can enhance your home. 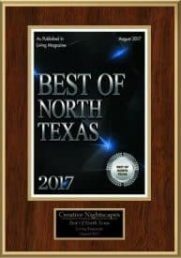 At Creative Nightscapes, we excel at helping DFW homeowners find the right balance of security and style when choosing this type of lighting. Whether you just want a couple of security lights for darker, more concealed areas around your home or security lighting that protects the entire exterior, we have the right options for you. Having security lights installed means that you’ll be using more electricity overall on your property. However, choosing LED security lighting helps keep this increase to a minimum. When you have security lights with LED bulbs, your utility bills will end up being lower over time, since these bulbs are energy-efficient and use less energy than incandescent bulbs and other types of security light bulbs. LED lights for security are also safer to have around, since they remain cool, even when they’re on for hours. These bulbs also have a lifespan that’s considerably longer than other bulbs, so you don’t have to get replacements for them often. In fact, these bulbs can last for about ten years. LED security lights come in a variety of styles and types, such as floodlights, motion detection lights, and spotlights. Depending on your security needs, you can choose to have one type of lighting or combine different types to provide even greater protection in areas that have a lot of potential hiding spots for intruders. 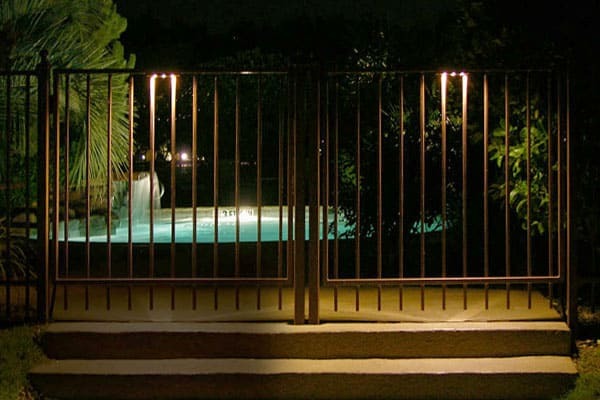 Creative Nightscapes has experts available to help you go over your LED security light options and make a decision that offers the highest amount of safety for your DFW home. When you have home security lights installed outside your Dallas-Fort Worth home, this can provide you with a lot of peace of mind. Leaving the exterior of your home dark makes you a more likely target for intruders. Making sure that your home’s exterior and your yard, along with your driveway and other outdoor areas, are kept well-lit at all times significantly reduces your chance of having intruders around. Home security lighting helps keep you and your family safe whether you’re all in bed for the night or walking to and from your home when it’s dark out. Home security lights are versatile regarding design, so you don’t have to worry about having lighting that looks plain or strictly functional on your home’s exterior. Creative Nightscapes can help you find lighting that accentuates parts of your home exterior while also providing your property with protection from intruders and enhanced safety at night to reduce the risk of falls. Whether you choose spotlights, floodlights or a combination of different lights, you’ll be able to sleep peacefully at night knowing that you and your family are as safe as can be from intruders. Keeping your home well-lit to deter intruders doesn’t have to mean seeing an increase in your energy bills. Outdoor security lights dusk to dawn have features that limit the amount of time they stay on. When you have this type of lighting for your home’s exterior, you don’t have to worry about forgetting to shut off the lights in the morning or turn them on at night. These security lights have sensors that cause them to automatically turn on when it gets dark out and shut off when it’s light out again. If you’re going away on a trip, you can keep intruders at bay without having to leave exterior lights on all the time. Outdoor security lights dusk to dawn provide a more efficient way to keep your property secure at night. They can also be used to add visual appeal to your home depending on the style you choose. Creative Nightscapes can help you combine function and flair, so you can enjoy the best of both worlds when it comes to security lights. Our experts can help you select dusk to dawn outdoor lights that help your property stay safe and look stylish. If you want to add security lighting to your home exterior and landscape, give the experts at Creative Nightscapes a call at 817-581-6936. We’ll provide you with a consultation and quote at no charge, along with assistance in choosing the right security lighting to keep you and your family safe in your DFW home. Our professional lighting experts will help you determine the most effective types of security lights for your property.